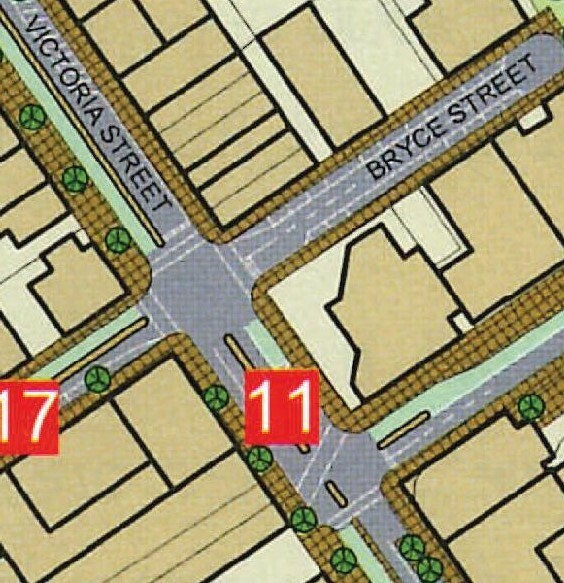 In October 2005, Hamilton’s Future 2020 Vision plan included a proposal for change to the Victoria St/ Claudelands Rd intersection, showing three main improvements: adding cycle lanes on Victoria St and Claudelands Bridge; removing the right turn into Bryce St, and adding the missing pedestrian crossing on Victoria St to the north side of Claudelands Bridge. By May 2008 the city leaders had moved on to the ‘Hamilton City Heart Revitalisation Project’. This plan did see the need for a good link between Garden Place and Claudelands, but the project did not actually show any detail on this intersection. In October 2010 someone in council commissioned ViaStrada to identify a cycle route through this intersection. Their drawing did have similarities to the Future 2020 vision thinking, but didn’t remove the right turn into Bryce St, and this concept shows that the reason we don’t have cycle paths and an extra crossing at this intersection is not because there isn’t space for a cycle path. Around the same time in October 2010, the owners of CentrePlace published a concept plan for the area around their investment, which included what they though the City Heart plan for the intersection of Victoria St with Claudelands Bridge should look like. 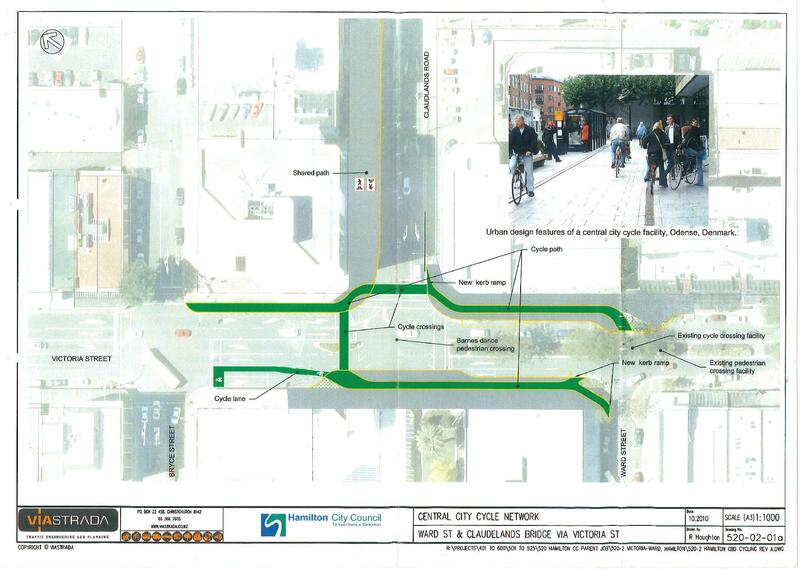 Here we see that the owners of CentrePlace did not see the need for creating a place for people biking or on foot to have a better link to CentrePlace on the north side of Claudelands Bridge, but they did suggest removing the right turn into Bryce St.
Like Ward St, the problem here isn’t about coming up with ideas for improvements our city, and we should also realise that these ideas don’t need a lot of money to trial them.